Quality improvement, quality assurance, and quality recognition. The allowing of more clients to pass away peacefully in their own care home without traumatic and unnecessary hospital transfers and admissions. Care home system changes and education to ensure better end of life and palliative care outcomes for clients. The accreditation of Homes leading to a Quality Hallmark Award, and to be included in a national database, with national recognition for their achievement and membership of a Solid Gold Club with numerous benefits that support continued recognition. Dorset. Castle Farm, Lytchett Matravers has achieved an amazing 'Top 10' in the country for their Gold Standards Framework. Forest Hill House, Corfe Mullen, and Larks Leas Rest Home, Blandford, were previously awarded 'Beacon Status' the top award and are awaiting their new result after their resubmission. West Sussex. 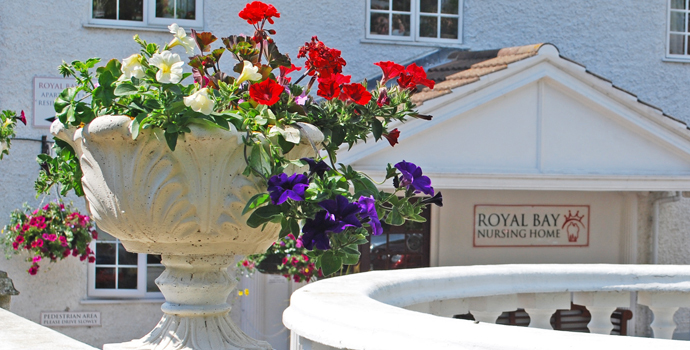 Royal Bay Nursing Home and Royal Bay Residential Home, Bognor Regis, have passed the 'Quality Hallmark Award'; meanwhilst Claremont Lodge, Fontwell, have had to resubmit their folder for the accreditation process. Northants and Wocestershire. The Old Vicarage, at Weekly, near Kettering and Herons Park Nursing Home at Kidderminster, Worcestershire, are at advanced stages, and will be submitting in the next few months. Our established and on-going ethos of promoting the quality of client care in all areas is borne out by our homes' commitments to achieving their Solid Gold Club memberships.